As Massacre’s bloody reign of murder continues and more heroes fall, Batwing closes in on this mad villain. 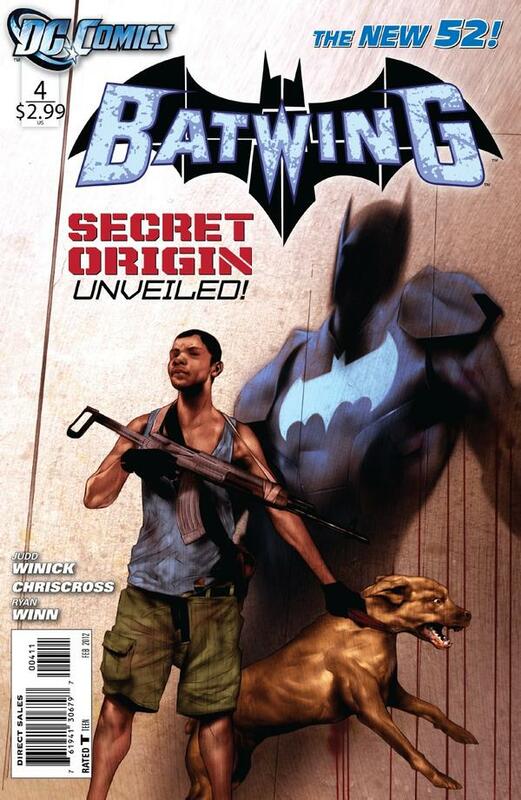 But with his memories stirring, Batwing’s dark past begins to emerge… At last, the truth of his past will come to light. Batwing has recovered from his previous fights with Massacre (See Batwing #1, Batwing #2 and Batwing #3 for details) but arrives too late to save Dawnfire, the latest member of “The Kingdom” to die by Massacre’s hands. 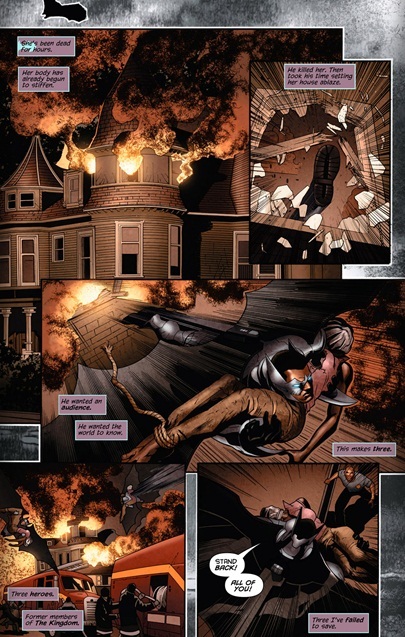 He retrieves her body from the burning apartment before heading back to his HQ. There he remembers his past as a child soldier and his brother’s apparent death when he and his brother refuse to follow the orders of General Oya Keita to kill innocent people. David rebels and captures Keita and hands him over to the very people he hoped to kill. After this, he leaves the child army and begins his road to redemption and meeting Matu Ba. In the present, he decides he must find the rest of “The Kingdom” before Massacre does if he is to have a hope in stopping him. Art- My man Chris Cross fills in for series regular Ben Oliver and turns in the very best art I’ve seen from him EVER. I’m used to his work on the firestorm series and cult hit Slingers (Which I’m also a fan of) but this? This blows everything else clear out of the water! Chris has a very animated feel to his art, some may even call it “cartoonish” when coupled with vibrant colors but here he finds a style which conveys the established sombre and serious tone of Batwing and as a result, unless you checked to see his name as artists you may very well have missed it. Kudos Chris, this is very fine art indeed! Origin- At last a glimpse into the past of the man behind the mantle, David Zavimbe’s past as a child soldier, his family’s tragic death, his remarkable skill and his road to redemption all get touched on with highly emotive effects. Mystery- Who is Massacre? Is he Batwing’s long thought dead brother? Why is Massacre killing the Kingdom? How did they betray the people of Africa? Successor- You guys must be pretty annoyed every time I mention Unknown Soldier but I can’t help it. 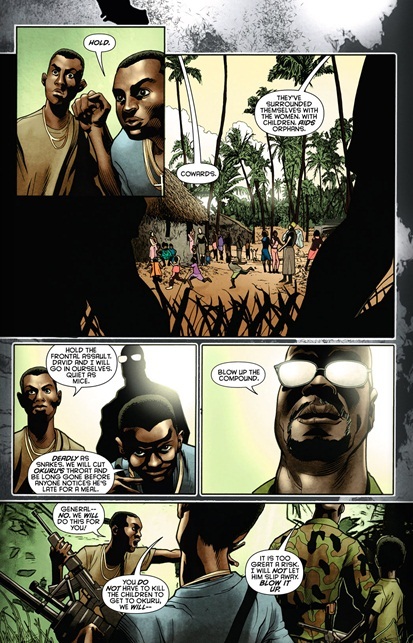 The fact that the series is dealing with children whose parents have died from HIV/AIDS and child soldiers, brutality and various harsh realities that Unknown Soldier has are clear comparisons but in a way Batwing seems to be taking the baton from Unknown Soldier and is presenting these realities in a book that will certainly grab more mainstream attention. Kudos to Winnick on crafting a book with enough reality and fiction to make this book both relate-able and informative for the average comic reader! David Zavimbe/Batwing– With every passing issue I fall more and more in love with Batwing, his dark past, his quest for redemption…it’s all very engaging! Cover- Courtesy of Ben Oliver and his stunning Photoshop coloring, a young David Zavimbe as a child soldier with his shadow as Batwing. This style has been used countless times before but feels right at home for the story within. Massacre– Everything’s seems to be alluding to him being David’s older brother….a bit cliche isn’t it guys? Hands down Top 5 book in the World today!